IDEA-IMATGE-UNIVERSITAT RELOADED is an intervention that tackles issues related to construction and perception of images as a fragmentary, disorganised, non-lineal process, linked to its present context (the Universitat in this case). The exhibition takes place in the Cultural Centre La Nau, which is associated with the Universitat de València. It defines part of the thematic element of the proposal, in consonance with the interests of the Laboratory of Light on experimenting and reflection on perception, devices, images and knowledge. 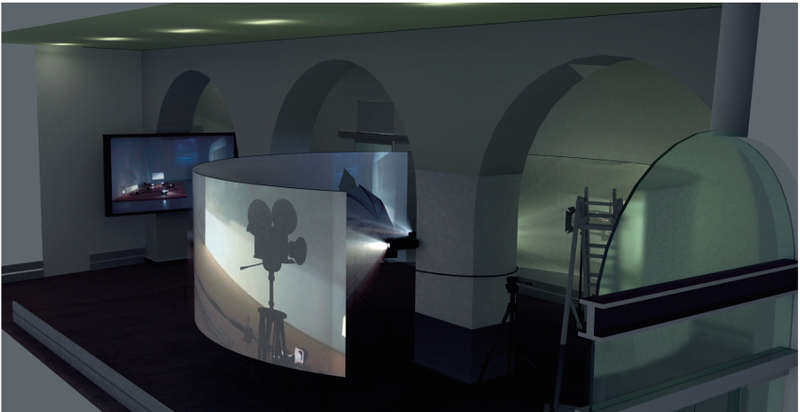 The central element is a cylindrical screen with a semi-panoramic projection of images that stablish a dialogue with the exhibition space, its architecture, history and context. The spectator plays a key role since they will activate certain mechanisms of the installation with their actions and presence. The projection in non-conventional screens is a constant in the work of the Laboratory of Light since its beginnings, as well as the interaction with the spectator and the technical mechanism of image manipulation. In this case, IDEA-IMATGE-UNIVERSITAT RELOADED is also the result of the research projects in which the Laboratory of Light is currently working on: “Development of interactive systems for the creation and projection of image-light and sound” (2018-2020) and “Cyclops. Creative visualization of sound” (2018-19). In these projects, they collect the experiences of several previous research projects about interaction, such as “Amplified vision: visual tracking systems for interactive installations in the field of digital art” (2009-2011), directed by María José Martínez de Pisón, or others about the concept of screen “Mutant screens. The interactive audiovisual projection with mapping techniques in non-conventional spaces” (2014-2016), directed by Amparo Carbonell and Emilio Martínez. The inclusion of RELOADED in the title of the exhibition alluded to a previous project, “PB 97-0335 [idea] [image] [university]”, in which we tackled the importance of issues related to the development of knowledge. Particularly, we reflected on the concept of University and how, from an artistic point of view, we can offer alternatives that expand our conscience and experience in regards of this. At the end of the 1990s, we were working in R&D project, “Suppliers that generate image-light”, funded by the Ministry of Education and Science (MEC). We carried out an experimental work with the interactive possibilities that allow digital technologies. 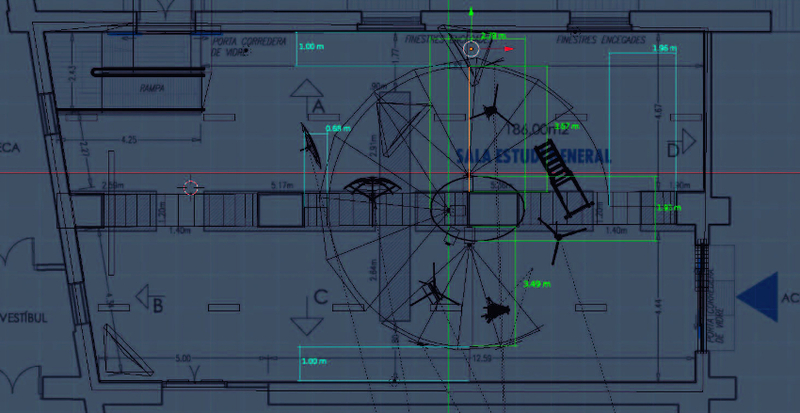 It resulted in an exhibition, called “PB 97-0335 [idea] [image] [university]”, which was displayed in the Exhibition Room of the Polytechnic University of Valencia in February 2001 and in the Espace Brasseurs of Liege, Belgium, in November 2001. The current exhibition IDEA-IMAGE-UNIVERSITAT RELOADED, even if it is new and different, it retrieves some of the matters that we tackled back then and it contextualises them in the time and place in which it is represented. The idea-image of the Universitat that we put forward necessarily stems from the complexity and complicity of the individual and the collective, as we are beings and institutions, centres, departments, laboratories, offices, libraries… Living spaces navigated by streams of energy that can transmit and create knowledge, drawing possible constellation which stablish new figures from the already existing data”. Founded in 1499, the Universitat de València is a clear referent on how knowledge has been produced and has evolved throughout history, and its architecture reflects and contains a large part of this collective history. The Cultural Centre La Nau is located in the emblematic building of the Universitat, which was its origin and which suffered several modifications and extensions through time. Nowadays, it is a representation of the Universitat in the city – it holds the paranimf, theatre, library and art and bibliographical collections of great historical value. IDEA-IMAGE-UNIVERSITAT RELOADED’s main device in a cylindrical screen of 8 metres of diameter by 2.5 metres of height, hanging by 50 centimetres from the ground and 3 metres open in a sector of its perimeter. This allows for the spectator to introduce themselves in the interior and visualize the projection from both sides, exterior and interior. The cylinder has a 25 metres perimeter and a retro projection screen of 22 metres, which offers a projection surface of 55 square metres. 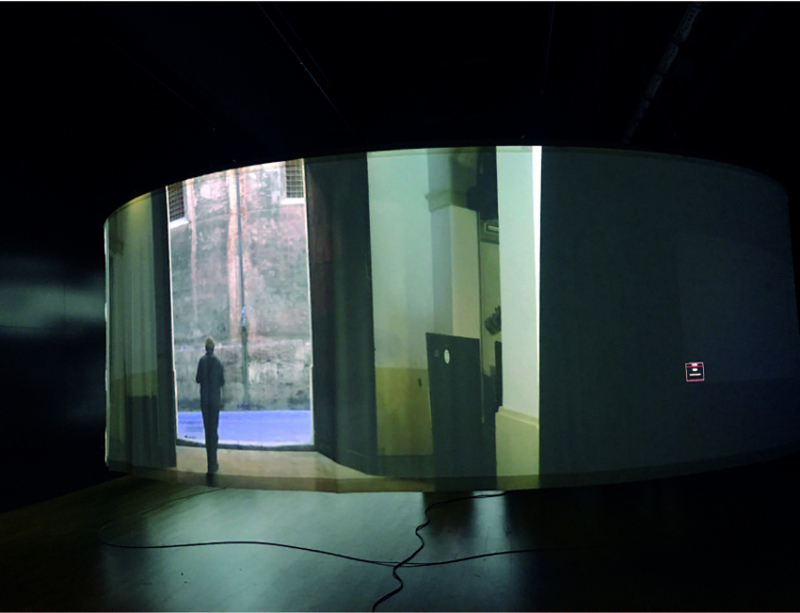 The projection, in a 16:2.5 (6.4:1) format, is a semi-panoramic which locates us in the tradition of panoramic representation that began with Robert Barker in Edinburgh in 1789 and that continues until the direct and indirect references of several contemporary artists, as Pepa López Poquet: Juan Downey, Marin Kasimir, Jan Dibbets, Edmund Kuppel, Sam Taylor-Wood, Christian Ziegler, Luc Courchesne. The relation between the evolution of the technical devices of reproduction of image and the panoramic representation has been a constant in our project, in the words of Pere Freixa (2005): “the panoramic means a rupture in the way of representing and perceiving the glance… The conception of the panoramic space as a circular projection screen where virtual worlds are presented, represented or projected will be kept on and become a legacy for the cinematographic and virtual systems developed until today”. Between 2006 and 2008 we worked on the developing of panoramic in “Interactive cities. Inteface digitais”, a project of collaboration between the art school of the Polytechnic University of València and the Universidade Federal do Rio Grande do Sul. We had reflected upon the conceptual differences on the approximation to the concept of panoramic from different devices and technical tools, particularly digital technologies. In the words of María José Martínez de Pisón: “Amongst the transformation of this quick technical development of image, one can also find the loss of its iconic value in favour of less visible direct relations.These are shown through the visibility of the process – that constitutive redundancy transfer the signification until the connection that is stablished between partial visibilities, some even casual visibilities. Far from determinism and the cause-effect relation that may have guided some cinematographic representations, digital technology operates by gaps or significant voids”. IDEA-IMAGE-UNIVERSITAT RELOADED is an installation designed taking into account the exhibition space in which it is going to be presented. Its dimension takes up almost all of the 10 metres of the exhibition room. The 8 metres of the cylinder only allows for a very small place on each side so that the spectator can walk from one side of the room to the other, obstructing not only movement but also visibility. Even if the image is projected in a retro projection screen that allows us to see it from the interior and the exterior of the cylinder, we can only have a fragmented image of it. It is impossible to visually embrace all of it, which we think is parallel to the nature of the image to have a complete or unique comprehension of it. Thus, we opt for a fragmentation of the image and the experience. On the other hand, we have the possibility of entering the interior of the cylinder, accessing an even more immersive experience. In this case, the device would allow us to move one of the projectors that merges its image on the general images of the screen, modifying and interfering in them with numeric data and other elements, which results in the transformation of the sound the accompanies the images. This offers us another level which was not detected at the beginning of the audiovisual projection. This double condition of inside and out is intimately linked with the conditions of the room itself and the conceptions of the projections. 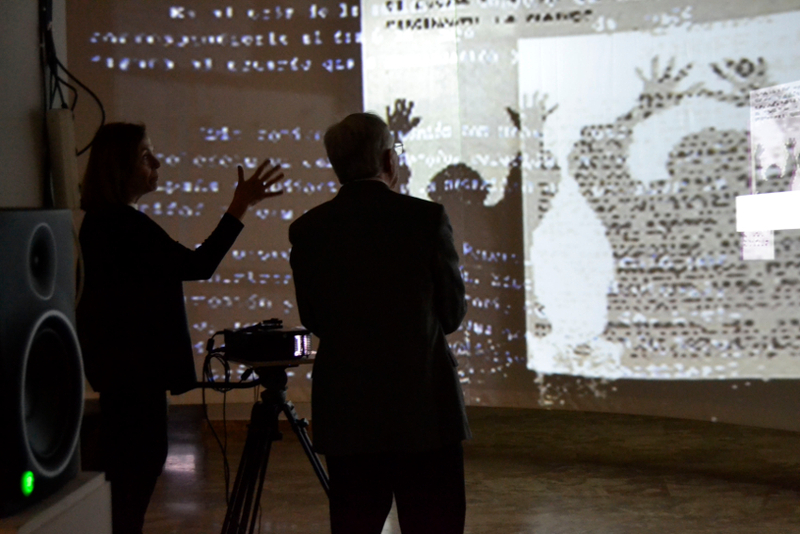 The final projection exchanges the images, generated by the digital systems that take part in the device, and the documental recordings carried out because of the exhibition in La Nau. These recordings tackle three aspects that we think are significant and inscribed in the own physical space of La Nau. The first one deals with the architectural space of the building, located in the old Jewish quartier of the València. This recording was made from images obtained in the first cartographies of the city, especially the map produced by father Tosca in 1704, which allow us to know eighteenth-century Valencia with great precision. Another of the audiovisual documents takes up the social context in which the Universitat has been both a witness and a protagonist of the transformation process of the city in our most recent history: the transition from dictatorship to democracy since the ending of the 1970s until the 21st century. Lastly, we also father one of the most important legacies of the Universitat: its bibliographical archives. The library is an open space for researches and users in which one can also find some of the copies of the first books ever published in Valencia and Spain in the fifteenth century, as well as unique documents that gather scientific activity from that time until our days. López Poquet, P. 2007. “Imagen-Espacio-Tiempo. El panorama”. Consulted on 20 Janurary 2019, on <http://espai214.org/cidadesinterativas/>. Freixa, P. 2005. “La fotografía panorámica y la representación del territorio: antecedentes para una indexación virtual del mundo”. En: Primer Congreso de Historia de la Fotografía. Zarautz: Photomuseum, p. 3. Consulted on 20 January 2019, on <https://www.dtic.upf.edu/~freixa/>. Martínez de Pisón, M. J. 2007. “Salvando las distancias”. Consulted on 20 January 2019, on <http://espai214 <.org/cidadesinterativas/>.